Start your exciting and fun-packed Cancun to Chichen Itza tour with the arrival at Cancun where you will be greeted and received by one of our representatives. After completing all the formalities, check into the pre-booked hotel and enjoy rest of the day at leisure with dinner and overnight stay at the hotel. 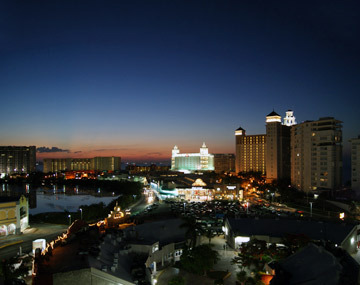 Cancun is one of the thriving cities of Mexico on the Yucatan Peninsula bordering the Caribbean Sea. It is a home to the second largest barrier reef and is the most sought after tourist destination for Scuba diving and snorkelling. After relishing delicious breakfast enjoy the sightseeing tour of Cancun renowned as a paradise for beach lovers and adventure enthusiasts. Enjoy a visit to Tulum, a dreamy place where you can spend your whole day at the beach, visit the Sian Kaan Biosphere Reserve which is a protected and unspoiled natural wonderland or visit the Coco Bongo Cancun to enjoy the thriving nightlife. Return back to the hotel for dinner and overnight stay. In the morning post breakfast proceed towards Chichen Itza which is a world- famous complex of Mayan ruins on Mexico’s Yucatan Peninsula. It is one of the most visited archaeological sites in the country which is visited by 1.4 million visitors every year. Upon arrival, check into the hotel and enjoy rest of the day at leisure activities with dinner and overnight stay at the hotel. Begin your day with delicious breakfast and then proceed for the guided sightseeing tour of Chichen Itza which is a sacred site and was one of the greatest Mayan centres of the Yucatan Peninsula. Visit the Casa Colorada which is one of the best- preserved buildings of Chichen Itza, visit the Temple of Bearded Man, La lglesia, Tomb of High Priest, Sacred Cenote, Temple of Skulls, El Caracol or the Observatory, Temple of Kukulkan etc. Enjoy the lunch and take some rest. In the evening attend the light and sound stage show at the Archaeological Park and enjoy the dinner at the beautiful terrace of Mayaland Hotel. Return back to the hotel for overnight stay. On this day of your Chitzen Itza Tours proceed towards the northern coast of Yucatan Peninsula via the magnificent site of Ek Balam which is a Yucatec- Mayan archaeological site in the municipality of Temozon Yucatan. It is composed of several temples a large pyramid and two palaces which are located in the center of the city is the most mysterious cities ever discovered. After exploring and marvelling these attractions proceed towards Rio Lagartos and enjoy a wonderful boat ride and visit the feeding ground of beautiful pink flamingos. Return back to the hotel for dinner and overnight stay. After breakfast begin the full-day tour with pickup from your hotel to depart towards the center of Izamal. Walk through the cobblestone streets of downtown or a horse-drawn carriage stopping at some of the major attractions of the city which include small pyramid of El Conejo and the pyramid of Kinich Kakmo. Enjoy the traditional Yucatan lunch and then proceed towards Merida. Upon arrival, enjoy the walking tour of Merida and visit Zocalo or Main Square, the Casa de Montejo, the City Hall and palace of the state government and explore the markets of the city to buy its authentic crafts. After some lunch continue the walking tour towards the church of Tercera Orden, the University of Yucatan, the Peon Contreras Theatre etc. Board a traditional horse-drawn carriage for a ride towards Paseo de Montejo to visit its regional museum of Anthropology and history. After enjoying a visit to all the striking attractions of city proceed towards Uxmal. Upon arrival, check into the pre-booked lodge for dinner and overnight stay. Post breakfast enjoy the guided sightseeing tour of Uxmal which includes some major attractions of the city like the oval-shaped Magician’s Pyramid, the Nun’s Quadrangle depicting the Mayan Rain God, the magnificent palace of the Government and the impressive Great Pyramid. In the evening attend the Uxmal light and sound show staged at Uxmal’s central plaza. Return back to the lodge for dinner and overnight stay. After morning breakfast you will be transferred to the village of Becal which is famous for the Panama hats and then proceed towards the city tour of Campeche which was once the fortified Pirate Haven. Enjoy the walking tour of the city which is a UNESCO World Heritage site and is a typical example of a harbour town from Spanish Colonial Period and modern times. Visit its key attraction that includes Colonial Center, The Bulwarks, nearby beaches; enjoy a ride on one of the trams etc. Return back to the lodge for dinner and overnight stay. Depart from the lodge after breakfast and proceed towards the first stop of your journey the Kabah which is a Mayan site on the Yucatan Peninsula is famous for its 9th- century buildings which are in the Puuc style of architecture. Visit the Palace and the Arch of Kabah which marks the entrance to Sacbe or linking path between Kabah and UXMAL. Then proceed towards Sayil which is renowned for its three-tiered Palace which is a labyrinth of 70 rooms which are adorned with chaac masks carved in stone. The next stop over is Labna which is a lovely Puuc Maya village where you can visit the Palace and the Mirador. Take some lunch and after few relaxing moments proceed towards the Caves of Loltun which is a natural masterpiece which is engraved with pre- Maya engravings dated back to over 4000 years and then proceed towards Tekak where you visit the 17th century convent and fortress like chapel which is a testimony to Yucatan’s turbulent past. After exploring all these amazing sites of historical importance return back to the hotel for dinner and overnight stay. On the last day of Your Yucatan tour post breakfast depart to the archaeological site of Tulum located in the Caribbean Coast and after a brief visit proceed towards the airport for the return journey. The Yucatan Peninsula is located in the southeastern Mexico which separates the Caribbean Sea from the Gulf of Mexico. It is one of the hot spots for nature lovers. It is blessed with unmatched scenery and offers the best diving and snorkeling sites in the world. Apart from this, it has many biospheres and national parks that provide homes to the various exotic species of birds and animals. So pack your bags and book Yucatan Tours from Cancun and enjoy your holidays in the most serene surroundings. With BookOtrip rest is assured for a fun-packed and the most exciting holidays to any choicest destination around the world. We help you to get hassle free travel experience by booking your flights, holiday packages, hotel accommodations, car rentals etc. I am very happy with Bookotrip's service and i really enjoyed the trip. Hotels which were provided was very good. I was very happy with timely response from bookotrip ?